Train operator Southeastern has had its franchise to operate services in south London, Kent and East Sussex extended for a further two years. Southeastern passengers suffered delays, cancellations and amended timetables during snow this winter. The company also faced criticism when it announced that it ran an average of 82.04% of trains on time in 2010, fractionally beating its 82.0% target. The government has now extended the company's franchise to 31 March 2014. Southeastern said the Department of Transport (DOT) formally offered the continuation after it met the performance criteria set out in the franchise agreement. Managing director Charles Horton said: "We're pleased that the current Southeastern franchise will now continue until March 2014. "Throughout, our focus will remain on improving services for our customers." 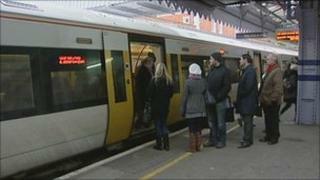 MPs demanded that Southeastern re-examined the punctuality figures announced in January. In February, an independent report by the University of Sheffield, commissioned by the rail firm, showed the figures were correct. If punctuality had dropped below the 82% target, season ticket holders would have qualified for a 5% discount. The company has now said it will change its compensation scheme from this summer to a "delay repay" process. It means that any passengers delayed by 30 minutes or more can claim compensation, bringing Southeastern into line with the Southern and London Midland franchises also run by Govia. "This is an arrangement that will be welcomed by passengers and rail user groups," said Govia chairman Keith Ludeman. Southeastern also announced that its Javelin high-speed rail services introduced in December 2009 are to be extended. From 23 May, Javelins will run from Maidstone West via Strood to London's St Pancras station on a trial basis. To allow the introduction of the new Javelin service, existing services to and from Rochester and Faversham will be diverted. The current Broadstairs services will now also call at Rochester and be increased to 12 carriages to accommodate additional passengers.